And if you need something to listen to while you solve, you could always go here and download "It Loves Cellos". Time for another installment of the semi-regular feature in which I treat irrelevant search queries in my referral log as if they are letters to an advice column. Here's the question: "what will happen to an astronaut if it loses a tie rope on while repairing the spaceship in the space?" It will drift in whatever direction it was moving when the tie line disconnected. If it were a human, the remaining astronauts would then presumably attempt to rescue it, but since it is a sexless cyborg, they will probably opt not to risk their lives to save it (the high cost of cybernetic astronauts is NASA's problem, not theirs). U.S. and World Sudoku Champion Thomas Snyder now has his own report on the sudoku championship here. So, yes, I went to the U.S. Sudoku Tournament today, even though I had no illusions that I would come close to winning my division (I competed as "intermediate"), because, what the heck, it's a big puzzle event, and Philadelphia's only two hours away. Lorinne came along as a spectator. I signed us up at the last minute and waffled about whether to attend the post-event dinner, which was $20 a person and scheduled from 4:30 to 6:30, after the awards were to be handed out. In the end, I ponied up for dinner, because it seemed likely that the other people I knew would also have signed up for it, so it would be the social thing to do, even though it was probably going to be semi-lame hotel-type food. I dragged myself out of bed at 5:45 to get to Philadelphia in time for the 11:00 event start -- an hour of groggy morning preparations, then an hour to get to Port Authority to catch an 8:00 bus arriving in Philadelphia at 10:20. The bus left late but arrived on time, so, yay. The production values of this event seemed rather higher overall than the crossword tournament -- big projection screens set up on either side of the stage showing a closeup of whoever was speaking, or the timer for each round while the competition was in progress, or the solvers in the finals; a ginormous freakin' banner behind the stage; large novelty checks for the winners. And huge prizes -- $10,000 for the advanced division winner, $5,000 for intermediate, $3,000 for beginner. Seems like a lot of thought went into making this event something to remember! Until you find out what the second- and third-place winners in each division win: a gift bag. That's right -- you go on stage, compete at the big board, manage to finish a cruel sudoku less than two minutes behind the unstoppable Thomas Snyder, and what do you get for your trouble? Squat. Even the 12-year old kid who won the bonus puzzle in her age division won $100! Did anyone consider just how lame that is? I had a good time at the event, despite not being especially competitive -- I finished 35th-ish to 42nd-ish in my division in all three rounds (hard to tell exactly where I finished with the slightly half-baked scoring system used at the tournament). Each round consisted of three puzzles of increasing difficulty -- if you registered as a beginner, you solved only the first one; intermediate solvers had to solve the first two; and advanced solvers had 30 minutes to get through all three...although the 30 minute time limit was really just to give people time to solve without the tournament lasting all day. Since the first person to correctly finish each round in each division advanced to the finals (or the second person if the first person had already qualified), the winner of each round was determined well before the time limit elapsed. The puzzles (by Wei-Hua Huang) were all excellent, although after I tried solving one of the advanced puzzles during a break between rounds, I felt smart about not having signed up as an advanced solver. The one in the first round was particularly evil. (I did crack it eventually; the necessary insight was very elegant, but incredibly hard to spot amid all the other information that didn't get you anywhere.) Based on my solving on the bus ride home, I would have finished only one of the three rounds within the time limit if I had competed in the advanced division. I enjoyed watching the finals. Unlike the crossword tournament finals, what you see on the boards onstage is the entire puzzle, so you don't have to consult a list of clues to appreciate the solving process -- you just get to watch it unfold in front of you. So that was cool. But the crossword tournament does have something the sudoku tournament really didn't -- a sense of community. Once the finals were over and the awards were being handed out, that was it. People started to leave, and efficiently. There was none of the lingering chatting you see after the crossword tournament because people have had such a wonderful time that they're unwilling to leave. (My friend and fellow competitor Dan asked, "When did all the energy get sucked out of this room?") Perhaps that was inevitable with an event this big (there were more participants than there have been at any crossword event), not held at a hotel where everyone is staying, and not lasting long enough for people to get to know each other. But it still made me homesick for Stamford (soon to be Brooklyn). 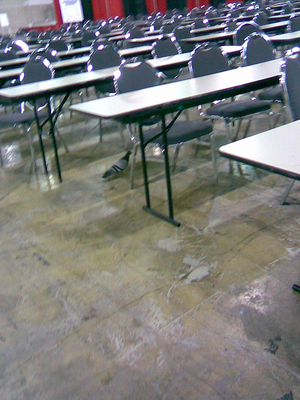 The eerie desertedness of the main hall after the event was underscored by the sudden presence of several pigeons. Oh, and the dinner? That turned out to be not a sit-down dinner in a banquet hall in the convention center, but a boxed lunch (sandwich, cookie, chips, apple, soda) served in the undecorated portion of the airplane hangar-like room we were in, just beyond the competitions' seating area. A few small round tables had been set up for the occasion. Lorinne and Dan and I were pretty cheesed off about this, and asked for (and got) refunds. Instead of having lame sandwiches, the three of us went for Italian food with champion Thomas Snyder (he and Dan and I are all members of the same Mystery Hunt team) and U.S. puzzle team captain Nick Baxter, who I've sort of known peripherally for a while but have never really talked to, so I enjoyed getting a chance to chat with him. He was particularly jazzed to hear that Sterling will be publishing a book of his favorite Nikoli puzzle type, Masyu. All in all, pretty fun, but I don't know if I'll make it out next year unless it's for work (if we get a booth to plug Sterling sudoku books). I'm still a crossword tournament loyalist -- and not merely because it's the one I have a prayer of winning someday. It's because that's where I first found all the other people like me. Solving a few sudoku can't compete. I was getting some money from the ATM this evening, and at the end of my transaction I saw this in a corner of the screen: "BANK OF AMERICA IS A PROUD SPONSOR OF THE WAR." I boggled briefly until my eyes scanned down and read the rest: "...a film by Ken Burns." Ah. Well then. Where's a poisoned needle that makes you sleep for a thousand years when you need one? 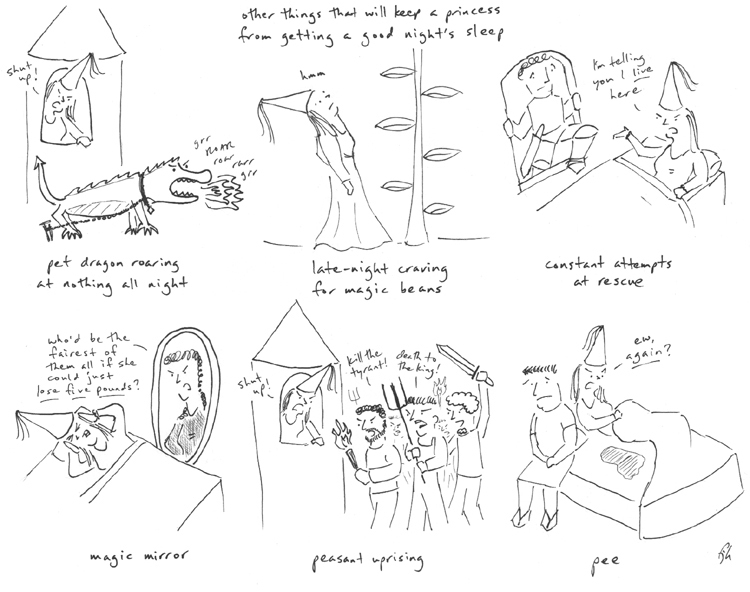 I think a lot of people missed this cartoon when I originally linked to it at On the Premises, so here it is in traditional Six Things format. Sorry for the massive lags in tie updates and blog posting in general; I'm working on a fantasy novel and it's taking up most of my at-home typing energy. 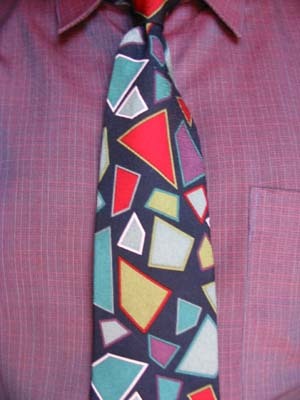 Still, can't neglect the tie photos forever. Here's another seven days' worth. Day 188. When I'm traveling out of town and see a Salvation Army or other used clothing store that doesn't bill itself as vintage and thus overcharge outrageously for everything in the store (such as the blatantly inaptly named "Cheap Jack's" here in New York), I always try to make time for a quick shopping run to see what they've got -- because whatever it is, it's something I wouldn't have been able to buy at home. So during the National Puzzlers' League convention in Ann Arbor, while being driven to or from the downtown area for lunch one day or dinner the next or whatever, I noticed a huge Salvation Army, and thought, "Oh, well, I guess I won't be making it there, since I'm at the mercy of the people in my car, and they're not likely to want to blow 30 minutes in the Salvation Army when they'd rather be back at the hotel solving puzzles." On Friday, though, Lorinne and I had taken a shuttle into town so we could solve a puzzle tour of the University of Michigan campus, and when we were done, we didn't feel like spending the money on a cab, and the bus routes didn't seem very convenient to us, so we decided to walk back to the hotel -- and as we started on our way, met some people who had just walked downtown from the hotel, confirming that this was not an insane thing to do. "It took about 30 minutes," they said. Day 189. Our friend Rachel was in town from San Francisco tonight, and we were having dinner at Les Halles, so I tried to class my act up a bit. This is the other tie I bought at Century 21 the day I was buying ties for this shirt (which is to say, day 160) for Lorinne's birthday party and couldn't decide which one to get. Day 190. 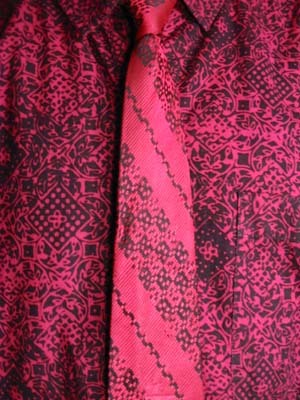 This pairing actually matches a little less well than it seems to in the picture; the tie is red while the shirt is a bit more magenta, but my camera kind of chokes on bright reds and so the two have become almost identical. Obviously I like it even though the match isn't perfect, though. Day 191. A sedate combination. The shirt is from a stoop sale that was across the street from our old apartment in Boerum Hill, and the tie is from a shopping trip with my grandmother on a long-ago visit to New Jersey (probably ten years or so ago). 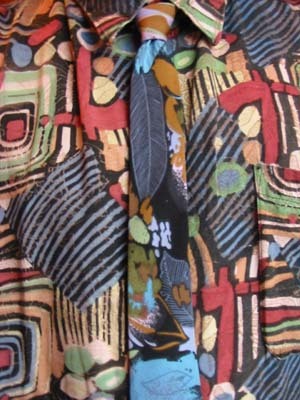 I bought a matching shirt for the tie on that trip; I wonder if I still have it. Day 192. 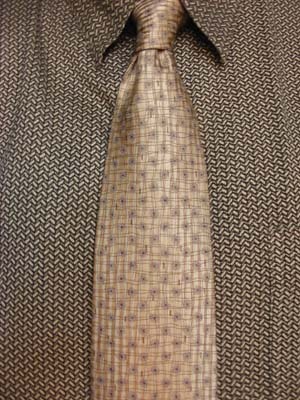 Trying out a different tie with the shirt from day 74. Day 193. 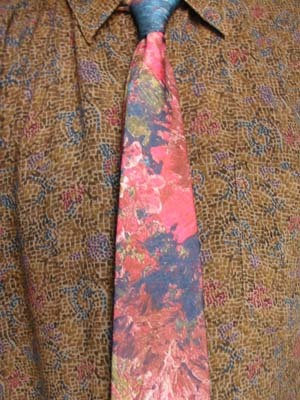 Not much to say about this combo -- I felt like wearing this newish tie, and in the absence of a patterned shirt that it matched, I went with this one. Day 194. 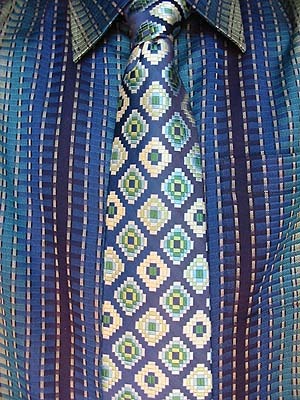 Another new tie acquisition, and I think the best tie I've yet found for this shirt. Next time: Reflective musing on the transience of objects. This Friday night I'll be performing in several segments of a fundraiser for Tuckaberry Productions, the children's theater company that Lorinne frequently works with in an actorly or choreographical capacity. The fundraiser is for grown-ups, however. I'll be singing a song, accompanying Lorinne on another song of mine, and we will also be tap dancing. Yes, tap dancing. Seriously. I tap dance. Oh, the hidden depths! Anyway, I think you'll agree this is not to be missed. There will also be other performances equally worth your time, as well as refreshments, silent auctions, poker, and a harrowing examination of the emptiness of your soul (optional). The show is at 8:00 this Friday, October 5, in the Great Room at South Oxford, which is at 138 South Oxford Street in Brooklyn. Here's a map (with nearby trains indicated). Buy tickets in advance here, to avoid the heartbreak of sellout.